Strategic meetings management (SMM) programs range from the basic to the highly complex, however, there are three basic steps required in gaining control over unmanaged expense and containing risk. The three steps are highlighted in red in the following graphic. 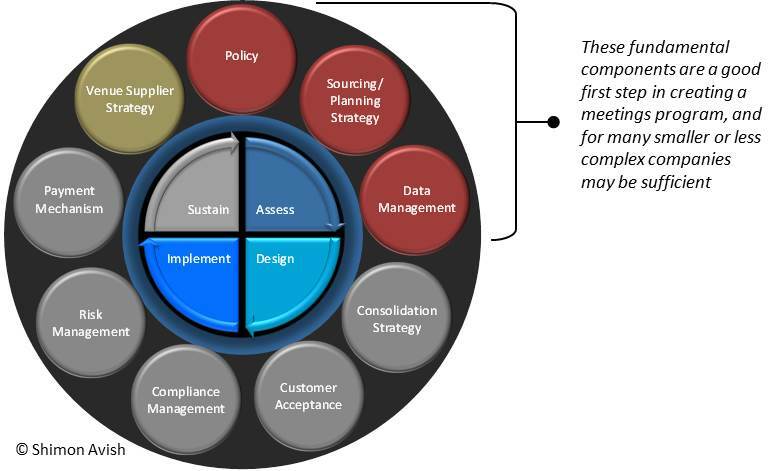 The other six elements shown in the graphic represent components of an SMM program that might be appropriate for larger and more complex organizations, such as those under specific regulatory requirements, or those in multiple locales or countries. Over the coming months I will provide more detailed views into these three key components of an SMM program, and with time a closer look at the remaining six areas.